Humanity is at risk from a series of dangers of our own making, according to Prof Stephen Hawking. Nuclear war, global warming and genetically-engineered viruses are among the scenarios which he singles out. And he says that further progress in science and technology will create "new ways things can go wrong". Prof Hawking is giving this year's BBC Reith Lectures, which explore research into black holes, and his warning came in answer to audience questions. He says that assuming humanity eventually establishes colonies on other worlds, it will be able to survive. "Although the chance of a disaster to planet Earth in a given year may be quite low, it adds up over time, and becomes a near certainty in the next thousand or ten thousand years. "By that time we should have spread out into space, and to other stars, so a disaster on Earth would not mean the end of the human race. "However, we will not establish self-sustaining colonies in space for at least the next hundred years, so we have to be very careful in this period." It is ironic that such a prominent figure in science identifies scientific progress itself as the major source of new threats. On previous occasions, he has highlighted the potential risks of artificial intelligence (AI) becoming powerful enough to cause the extinction of the human race. But he insists that ways will be found to cope. "We are not going to stop making progress, or reverse it, so we have to recognise the dangers and control them. I'm an optimist, and I believe we can." Asked for advice for young scientists, Prof Hawking said they should retain a sense of wonder about "our vast and complex" Universe. "From my own perspective, it has been a glorious time to be alive and doing research in theoretical physics. There is nothing like the Eureka moment of discovering something that no one knew before." But he also said that future generations of researchers should be aware of how scientific and technological progress is changing the world, and to help the wider public understand it. "It's important to ensure that these changes are heading in the right directions. In a democratic society, this means that everyone needs to have a basic understanding of science to make informed decisions about the future. "So communicate plainly what you are trying to do in science, and who knows, you might even end up understanding it yourself." 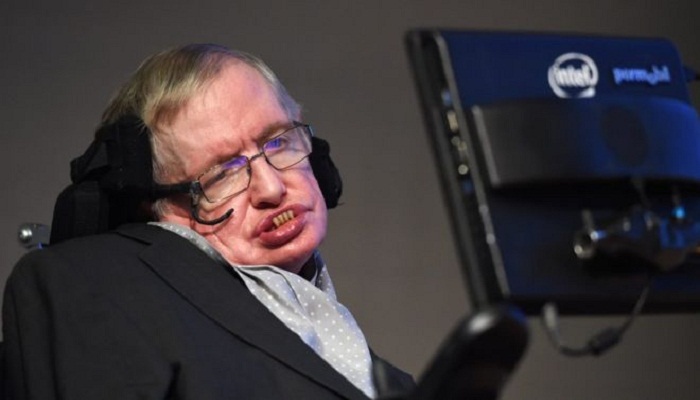 Since his diagnosis with motor neurone disease, Prof Hawking's determination to overcome the immense physical challenges of his disability has been a source of worldwide admiration and fascination. His daughter Lucy, a journalist and writer, who has co-written children's science books with Prof Hawking, was asked to explain his drive. "I think he's enormously stubborn and has a very enviable wish to keep going and the ability to summon all his reserves, all his energy, all his mental focus and press them all into that goal of keeping going," she said. "But not just to keep going for the purposes of survival, but to transcend this by producing extraordinary work, writing books, giving lectures, inspiring other people with neurodegenerative and other disabilities, and being a family man, a friend and a colleague to so many people and keeping up with friends across the world."